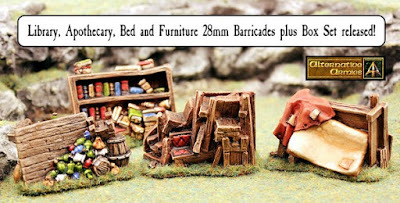 Alternative Armies: Library, Apothecary, Bed and Furniture 28mm Barricades plus Box Set of Eight released! We promised and now we deliver! 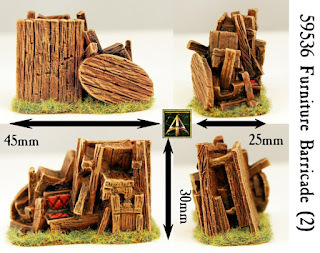 Now at Alternative Armies four new 28mm scale terrain Barricades each with a lot of personality. Following up on previous releases earlier this year the Library Barricade shows a sadder use for masses of books, the Apothecary has given up potions and bottles and more for a barricade, the furniture of a small home is piled in defence and lastly some poor sod was thrown out of his sty for his bad including the mattress to be used as a barricade. The value set has all these plus the Long Table, the Crates and Boxes, the Kegs and Barrels plus the Kitchen barricades with a saving of 10%. 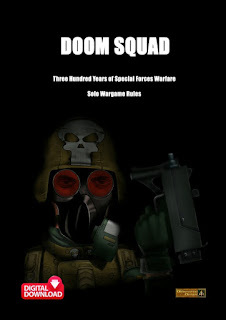 Super in any horse and musket or fantasy setting as well as Flintloque. 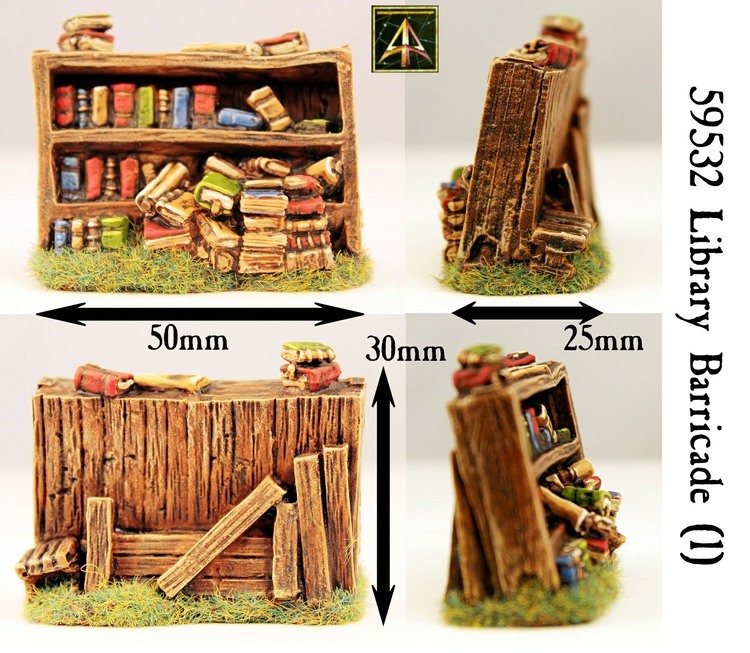 Go HERE or read on for more information about our entire 28mm Terrain range. If you already have our 28mm terrain in your collection you will know just how much detail and attention there is in every model. 59532 Library Barricade (1) – Go HERE. A sadder use for masses of books the library suffers the loss of knowledge when it comes to fending off the foe. Pile them high and sob but they will save your life! This pack contains one high quality 28mm scale grey tone resin terrain piece. A three level set of shelves made of thick wood with books lined across it and also scattered atop and on the ground in front. Put it on your table as an objective or cover or just for interest. It measures 50mm in length, 25mm deep and 30mm tall. You can purchase one with the buttons on screen or get three with a saving or get it pro-painted and ready to use. There are many more images from all angles on the page plus plain resin picture. 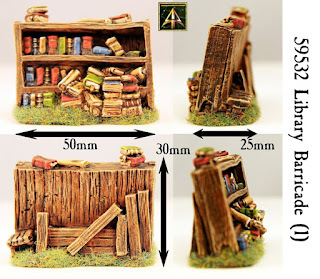 59535 Ruined Apothecary Barricade (2) - Go HERE. Potions and Bottles for all manner of ails and remedies dragged from the Apothecary along with his table and chair. What matter the remedies if you are dead! Get that barricade built! This pack contains two identical 28mm scale high quality grey tone resin terrain pieces. A table with chairs next to it heaped kegs and barrel behind and a great pile of glass bottles sloughed across the front. Put them on your table as an objective or cover or just for interest. Each measures 45mm in length, 25mm deep and 25mm tall. You can purchase a pack with the buttons on screen or get three packs with a saving or get them pro-painted and ready to use. There are many more images from all angles on the page plus plain resin picture. 59536 Furniture Barricade (2) – Go HERE. It may have taken a life time to carefully accumulate the furniture for your small home but now the enemy is at the walls and it has all been taken for barricades! This pack contains two identical 28mm scale high quality grey tone resin terrain pieces. A large round table with a rectangular table form the bulk of the front with chairs and benches piled against the back for bulk. Put them on your table as an objective or cover or just for interest. Each measures 45mm in length, 25mm deep and 30mm tall. You can purchase a pack with the buttons on screen or get three packs with a saving or get them pro-painted and ready to use. There are many more images from all angles on the page plus plain resin picture. 59537 Bed Barricade (2) – Go HERE. Some poor sod has been tipped out of his sty so that the bed, mattress and all, can be turned on its side and made into a barricade. This pack contains two identical 28mm scale high quality grey tone resin terrain pieces. A wooden bed frame on its side with a feather stuffed mattress drooping off one side and the blanket draped over it (oh plus the chamber pot too!). Put them on your table as an objective or cover or just for interest. Each measures 50mm in length, 25mm deep and 28mm tall. You can purchase a pack with the buttons on screen or get three packs with a saving or get them pro-painted and ready to use. There are many more images from all angles on the page plus plain resin picture. 59538 Barricade Boxed Saver Set (8 Different Models) – Go HERE. 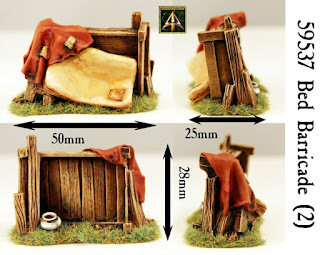 This bundle of 28mm scale grey tone resin terrain pieces gives you one of each of our eight barricades (codes 59530 to 59537) for use in any Horse and Musket or Fantasy or Flintloque campaign setting. There is a 10% saving over single pack purchases built into this saver set. While you can learn more about each barricade by looking at its own page the set includes: Boxes and Crates, Beer Barrels, Long Table, Discarded Kitchen, Library, Ruined Apothecary, Furniture and Bed barricades. A whole encampment's worth of blocking barricades. Each is possessed of a great deal of detail. Most of 45mm long and 25mm tall but some are bigger. You can purchase a set with a saving or get them pro-painted and ready to use out of the box. 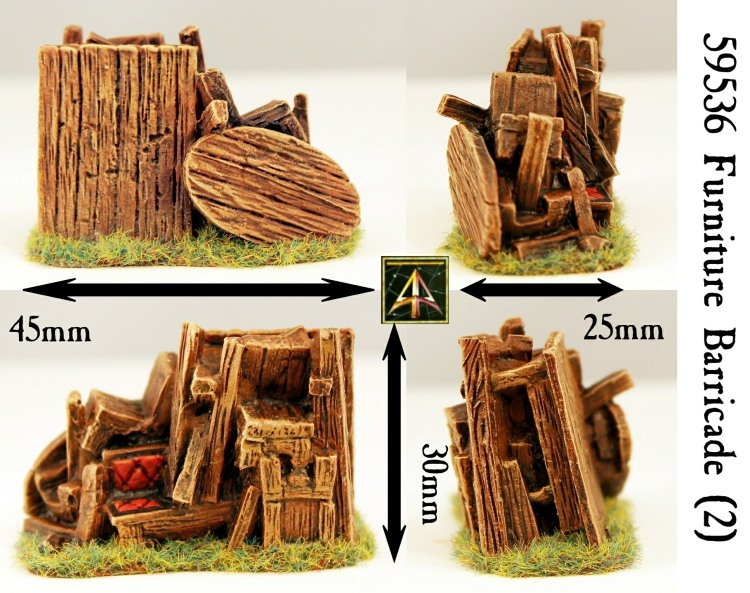 Alternative Armies has added to our excellent range of 28mm Terrain Range. This range is at home in any black power, horse and musket or fantasy setting. 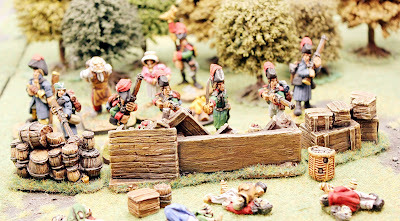 Each pierce is full of character and there are such things as Abandoned Beer and Goods Wagons, Corpse Piles, Campaign Table, Campfire plus stone wall pieces and barricades. Scatter them on your gaming table today. Go HERE. The smaller barricades come two to the pack while the larger ones are single piece to the pack. Grinning Skull and SHM new releases! 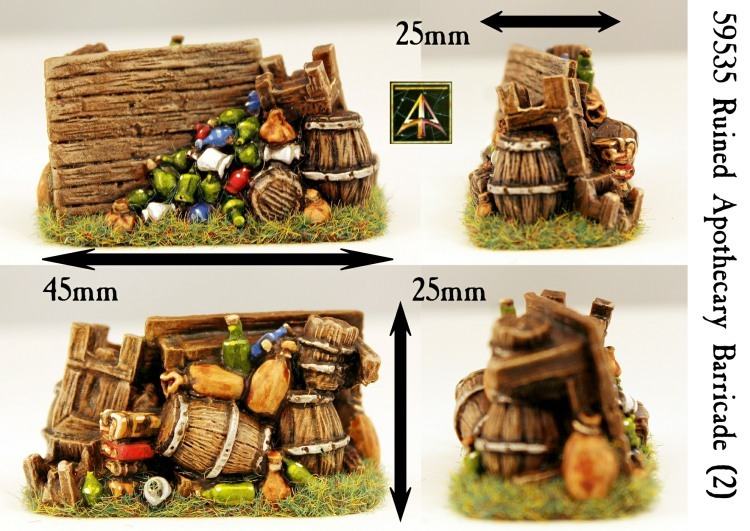 HOT 15mm Naga packs Swords and Bows now released!